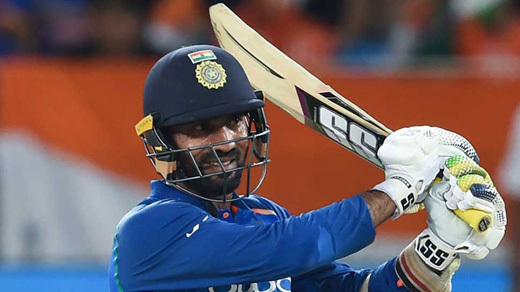 New Delhi, Apr 15, 2019 : The hot debate around who will be India’s second wicket-keeper to back up for Mahendra Singh Dhoni has finally ended as Dinesh Karthik has been named in the 15-member national squad at the expense of Rishabh Pant for the 2019 International Cricket Council (ICC) World Cup, which is slated to take place in England and Wales from May 30 to July 14, Zeenews reported. Reflecting on Karthik’s selection, chief selector MSK Prasad confirmed that the second wicketkeeper would only play in the World Cup if regular wicketkeeper-batsman MS Dhoni gets injured. Prasad further said that Pant was quite close to selection, but he missed out on wicketkeeping skills. Another important decision for the BCCI was to decide who will fill up the No.4 slot in the Indian squad with the likes of KL Rahul, Vijay Shankar and Ambati Rayadu all pushing their cases for the selection. Commenting on Shankar’s inclusion, the chief selector said that the BCCI had tried playing a few players after the Champions Trophy including Ambati Rayudu, but what Shankar brings is three-dimensional. Meanwhile, Prasad also revealed that left-arm pacer Khaleel Ahmed’s name was also discussed during the selection meeting. Virat Kohli will continue to lead the Indian squad at the 50-over mega event, while Rohit Sharma will serve as his deputy. India will kickstart their campaign at the marquee event against South Africa on June 5. Virat Kohli (captain), Shikhar Dhawan, Rohit Sharma (vice-captain), MS Dhoni, Ravindra Jadeja, Bhuvneshwar Kumar, Mohammed Shami, Kedar Jadhav, Jasprit Bumrah, Hardik Pandya, Kuldeep Yadav, Yuzvendra Chahal, Dinesh Karthik, KL Rahul, Vijay Shankar.